A stylish, sturdy and smart solution to enjoying your everyday cuppa, without beating up on your taste buds or Mother Nature by reducing landfill. Made from natural and chemical free glass. Strong, light and heat resistant. Dishwasher and microwave safe. Made from strong borosilicate glass, the JOCO cup is a ridiculously stylish, sturdy and smart solution to enjoying your everyday cuppa, without beating up on your taste buds or Mother Nature by reducing landfill. Did you know 2.25 billion paper cups are used worldwide every year and those figures are rising rapidly? The JOCO cup is microwave and dishwasher, BPA free and modelled after standard disposable coffee cup sizes, making them your barista's and the environment's new best friend. Glass is made from natural materials, lasts longer and is chemical free. Glass doesn't taint flavour and glass never goes out of style. It's the same glass that Pyrex, laboratory flasks and baby bottles are made from. Strong, light and heat resistant. Generally high street coffee chain will give you a small discount for using your own cup. This 12oz cup fits Starbucks 'Tall' coffee, Costa 'Primo' coffee and is a standard kitchen mug size. JOCO Cup is the reusable, portable glass coffee cup. Featuring hardened glass, a colourful silicone sleeve and award winning packaging. We are sure that JOCO will be your new best buddy throughout your journeys. JOCO have put a lot of thought into designing the right JOCO lid. The result is a sleek, ergonomic design with a fine taste for functionality. The Splash Safe lid ensures that you won't have to worry about wearing your morning coffee. Furthermore, there won't be any more embarrassing "nose tip stains" on the lid of your cup from the lack of clearance for that beak of yours with a risen drinking section. Every JOCO cup is fitted with a tonal thermal silicone sleeve, ensuring your coffee stays steamy. You can forget the goo at the base of the cup with JOCO cup's cyclonic base, which pulls sugar and other additives to the centre of your coffee, greatly improving dissolving and creating a balanced flavour. Look great while enjoying your favourite beverage, hot or cold, on the move or in the office. It's the clear cup with a clear conscience - JOCO Cup. - Made from hardened borosilicate glass. The same glass Pyrex, laboratory flasks and baby bottles are made from. Strong, light and heat resistant. 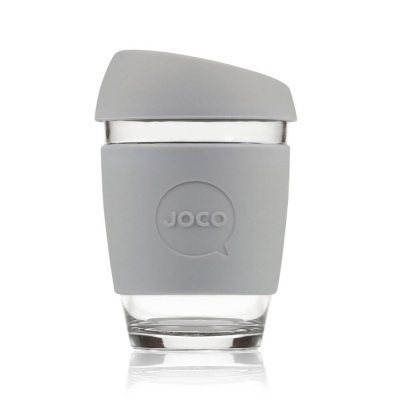 - Versatile - Use JOCO for coffee, tea and even water. You wouldn't use a plastic or ceramic mug for all drinks would you?